Cool, Bulgarian mags are win, etc. I think what the threadstarter is trying to say is: there is a picture of a Masada on the EB-page that seems to take AK-mags. The magwell is distinctively different from the regular Masada. Not sure if it's airsoft though. Was wondering when a 5.56mm style AK mag would be released for airsoft. Shame it's a hi-cap otherwise I'd be tempted. Which makes you wonder if this is the news Paul was talking about thats coming next week. Yep, I'd say that it's pretty big news. Edit: And they're working on a revolver launcher. Interesting. Whats the point of see-through mags with no dummy rounds in it? Just looks like a masada that takes 5.56mm AK mags to me, or am I missing something? Slightly peculior gun given the rareity of those mags. The revolving launcher does look kind of impressive, always thought the CAW one was interesting but horribly expensive (300 quid or more wasn't it?) and you still had to buy a bunch of shells... obviously will still have to for this. There's a thread out in the wasteland of the news forum for the AK masada already I'll say what I said there again : AK mags in airsoft are all the same, 5.45, 7.26 and 5.56 all fit the same mag well, so whichever mag it comes with matters not, as you can buy whichever you feel like. The mags actually look pretty good though, and if there was a magpulised airsoft AK out just like the one shown it might actually be able to cure my dislike for the pistol grip(by not using the horrid thing, but still). You can see how much ammo is left. Ah yes, good point. For some reason I'd forgotten that they all fit, though a masada with a 7.62 mag would look pretty odd. It is a shame they're hi-caps. I've actually just done that exact mod!! arsenal K 101 right? Am rather pleased with the results. 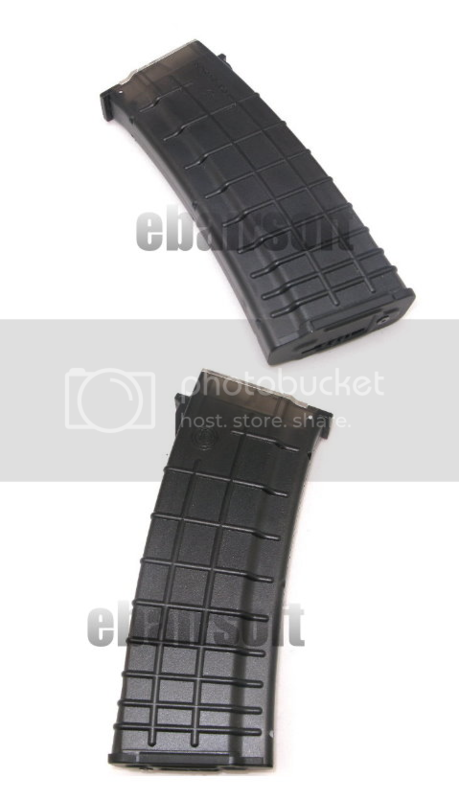 Yes, the mags shown are 5.56, however like said above in airsoft the magwell on AK's are all the same. So if this fits into that Masada, so will a 7.62 AK mag. Hence creating a 7.62 Masada. That would look nice in my Galil - but its a shame that they don't have mid-caps too. The tan firearm pictured above is a modified AK. Its owned by Travis Haley (that paul watermarked as his own...rofl) and has had quite a bit of custom work done to it. If i recall correctly its a modified Saiga. I have a Bulgarian 74 configured in much the same way and its a pretty nice shooter. Anyway, back on topic, someone else questioned a clear mag if you cant see the rounds but since its a hicap, you most likely WILL be able to see the rounds. Im still hoping for midcaps. I would rather have a regular Masada, but WTF is the 2nd gun in your post Sonny?? Jeeze I have never seen such a thing in my life.. Great looking gun who ever it belongs to..
That is a picture of the real prototype ak masada. So who knows if the airsoft version will even look like that. All of that over nothing, lol. Thanks for clearing that up, though. What exactly was cleared up?